Canada's Big Freight Systems, win TCA fleet safety award. NASHVILLE, Tenn. – Canadian-based carriers Big Freight Systems and Bison Transport have been chosen as winners of the Truckload Carriers Association's prestigious National Fleet Safety Awards. Big Freight Systems of Steinbach, Manitoba, Canada, received the award in the small carrier division (total annual mileage of less than 25 million miles) and Bison Transport of Winnipeg, Manitoba, Canada, won among carriers in the large carrier division (total annual mileage of 25 million or more miles). It marks the seventh consecutive year that Bison Transport has won the large carrier division. The awards were presented during TCA's annual banquet at the Gaylord Opryland Resort Tuesday night. Both companies will be recognized again during TCA's Safety & Security Division Annual Meeting May 21-23 at the Renaissance Phoenix Glendale Hotel & Spa in Glendale, Arizona. "TCA is proud to operate this contest, which spotlights companies that have innovative safety programs and a rock-solid commitment to safety in the workplace and out on the highways," said John Lyboldt, TCA's president. "Getting to the level of safety that our grand-prize winners have achieved requires much behind-the-scenes work and attention to detail. It is our privilege to name them as the safest truckload fleets in North America." According to entries submitted by the carriers, when Big Freight Systems was examining its safety data from a few years ago, it discovered that most of its accidents were occurring between the first snowfall and the end of the year. This "eureka moment" helped senior management recognize that the company's culture was due for a change. In the past, it had emphasized customer service and on-time delivery, but now it set a higher priority on the need for safety above all else. Beginning with two bold "Road Challenge 75" initiatives, the truckload carrier aimed to massively reduce its accident and claim costs. The process to shift the company's culture turned into a "journey" that required significant time and effort, but eventually Big Freight Systems achieved buy-in from its people. Soon, the number of accidents and claims began to go down even as customer satisfaction ratings remained steady. Now, Big Freight Systems has stopped "preaching" to its drivers about safety and instead educates them by using real-world examples. The company beefed up its driver recruitment practices and training, adopted electronic logs and dash cams, and adopted the slogan "Safety first, on-time delivery second." Fleet and non-driving team members regularly receive e-mails and satellite messages empowering them to shut down if weather is poor and not to take risks. According to the company's grand prize application, "Big Freight operates under a Continuous Improvement (CI) model, philosophy, and culture. A few years ago, we formalized our CI journey. Every team member has been trained and empowered to use specific tools to improve processes and eliminate waste as they pursue excellence. Since embarking on this journey, our company has implemented 1,765 new ideas. A journey is just that — a journey — but we believe that our CI commitment will continue to pay dividends in the months and years to come by ensuring we stay safe and competitive." Bison Transport has won the grand prize in the large carrier category for seven straight years and with good reason, contest officials said. The company's culture, centered on the mantra, "You're Safe with Me," truly revolves around safety as its primary core value. Like Big Freight Systems, Bison allows its drivers to evaluate weather conditions and determine if it is safe to drive or not. Before the onset of winter, all drivers and operations staff are required to take an "Adverse Conditions and Right to Decide" course, which is overhauled each year to ensure the material is fresh. In 2016, Bison delivered an impressive 13,625 courses to its employees. Core driving courses include 35 online courses, 10 classroom courses, and five simulator courses. To augment this safety training, Bison relies on supplier product specialists and maintenance and driver development personnel to disseminate information and initiate awareness campaigns so that employees have a well-rounded understanding of various equipment and safety features. Over the last two years, Bison has reduced insurance and accident costs by 26.6 percent. In its grand prize application, the company wrote: "Instead of interpreting safety as only a business of compliance to regulations, we view safety differently. Safety is an investment in our most important resource, our people. As owners and leaders, we have the privilege and responsibility to give everything we can and be honest in our efforts to ensure safety and livelihoods are protected. When people understand that we feel safety can only be measured as successful when everyone gets home safe, they also appreciate the energy we put into making sure that it happens." The application process for the National Fleet Safety Awards began with fleets submitting their accident frequency per million miles driven. 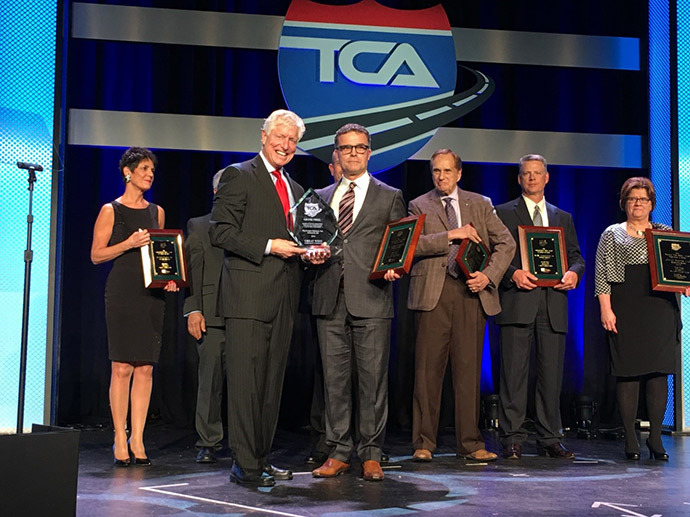 TCA selected the top three winners for each of six mileage-based divisions and had the results audited for accuracy by an independent expert. In January, TCA announced the names of the 18 division winners and invited them to submit further documentation about their safety programs. In order to receive the grand prize, both winning companies had to demonstrate that they strive to meet stringent standards in their overall safety programs, on and off the highway, and were judged to be the best in their commitments to improving safety on North America's highways.